Korean inspired skin care has taken the beauty world by storm in recent months. Korean brands being stocked by some serious power player retailers (including ASOS, Topshop and SEPHORA). Ever a sceptic, I was unconvinced ingredients such as charcoal, snail slime, egg white or red wine would deliver on what they promise (I was also a little put off to be totally honest). Then the kind folks over at Kocostar kindly sent me some goodies to try for myself. To say I have been converted would be the understatement of the century. I have subsequently sampled other Korean brands to see if my love of these products was Kocostar specific or more related to the cultural mix of “magic” ingredients. Keep reading to hear my thoughts on the brands and my top products to try if you fancy seeing for yourself (and trust me you really should!). I couldn’t write about Korean Skincare and not mention Tony Moly. Awarded Korean Global Leader in 2015, stocked in Urban Outfitters, Tony Moly is the ultimate in kitsch, fun, unique and urban skincare. I tried several products (I wanted to try at least a thousand). The Banana Peeling Cream (pictured) When Gwen Stefani sang “this sh*t is Bananas, B-A-N-A-N-A-S, I am fairly certain this product was her Muse. It has the most incredible formula and don’t get me started on that fragrance. It smells distinctly bananery (probably not a word but I am sticking with it) without being overpowering. Applied over the face to “areas of concern” (*covers whole face and neck, contemplates applying to entire self) the product exfoliates the skin deep into the pores. Rinsed after 3 minutes- and the magic happens. This left my skin softer than my one year olds’ bottom. A firm (pun intended) favourite. Red Wine Sheet Mask (I tried the whole range of “I’m Real” sheet masks and this was by far my favourite). Almost as good as an actual glass of wine. Presented in seriously cute packaging, each version of these masks depicts an image of the main active ingredient. The sheet itself is really generously covered with the solution, yet managed to avoid my pet peeve of running down my neck. The fit of the mask was snug and I was able to amble about without it coming off. After 15 minutes the mask is removed and excess product can be massaged into the skin until fully absorbed. My skin was left fresh, plump and generally in much better condition. I recommend using this once per week. Egg Pore Range (Blackhead Steam Balm, Tightening Cooling Pack & Pore Balm-Primer). Okay, so this packaging piqued my interest immediately, it reminds me of Lady Gaga at the 2011 GRAMMYs. Its not the most environmentally friendly. There is probably 80% packaging to only 20% product. 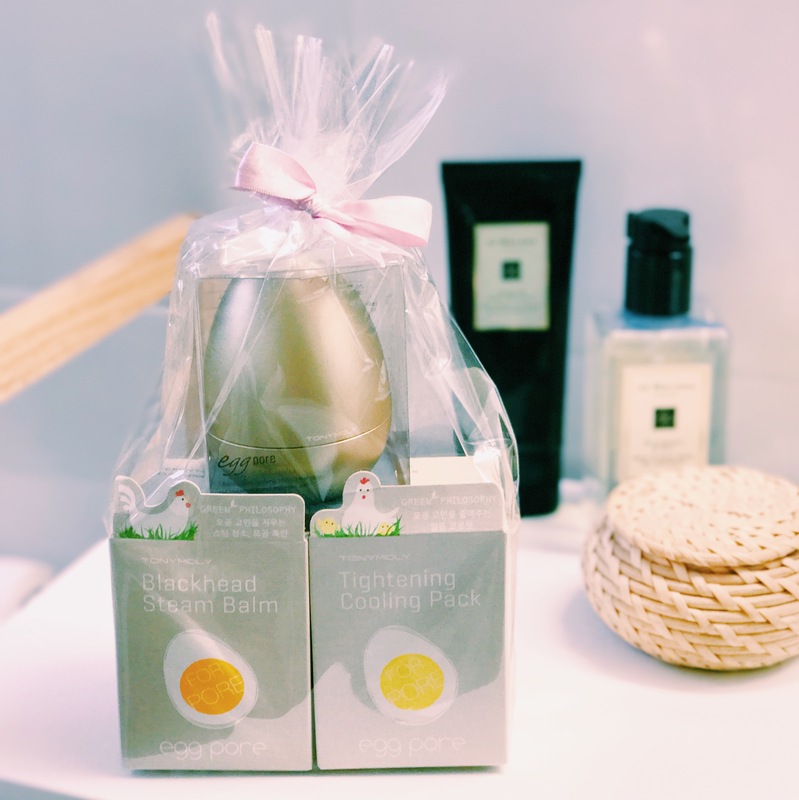 The “silky smooth balm” was a major let down, the most flash of all the packages in a golden egg, It did not live up to my eggspectations (I was doing so well… I just couldn’t help myself). The formula was much like Benefit Porefessional. However, it needs to be applied very lightly, if to thick it looks extremely patchy with foundation. Even more of a concern, I have oily skin and I found the primer to be very drying (not an easy thing considering I have a face greasier than a four cheese pizza!). Foot Peeling Pack: This 90 minute treatment was something I was so excited to try. I followed the instructions dutifully (you may have followed along on my instastories), I removed the booties after the agonising 90 minutes (I was so impatient, desperate to reveal my baby soft tootsies!) only to find that after rinsing, my feet were a bit softer and prune like but the only obvious change was the irreparable damage to my shellac pedicure! Beauty Blogger Fail! I had a mini hissy-fit and soon forgot about the whole saga. Three days later, my feet began to peel. I mean to the extent that I couldn’t show my feet in public. I was on the verge of heading to the GP thinking I had developed a really unfortunate skin condition, when after a week or so the peeling subsided. Revealed were feet that were softer than I could have hoped. A definite staple in my future “summer ready’ beauty kit. I will know better for next time- Peel first, shellac later and most importantly use 2 weeks prior to any barefoot social engagements! Hand Moisture Pack: Delightfully simple to use. This product does what you’d expect. It even transformed my granny hands into something passible for a woman in her early thirties. Well done Kocostar! Bravo. Slice Mask Sheet (Cucumber and Tulip were sampled): Almost too pretty to use, these sheet masks are just divine. They smell great and deliver massive hydration to parched skin. Using these is a truly pampering experience, I highly recommend use in conjunction with a large glass of wine, a scented candle and a rather deep bubble bath. Sheer bliss. Caolion Blackhead 02 sparkling soap- If this post were the Academy Awards, then this product would win best picture, for me it stole the show and has changed my skincare routine entirely. It is a 100% natural handmade soap for sensitive skin. Its ingredients work in harmony with your skin to eliminate impurities and purify the skin from within the pore. It totally handled my skin’s tendency to produce sebum in excess and without over-drying. My skin has NEVER been this good. Ingredients include Charcoal, Sparkling water, Cocoa, Coconut oil (you can read here how much I swear by coconut oil) and Lavender oil. Masque Bar Luminizing Peel Off Mask Try it, because there is nothing more satisfying than peeling this off. It felt great on and my skin looked much brighter for it. I use this fortnightly. Dull skin? Buh-bye. Oh K! Hydrogel Coffee Mask this anti-oxidant super mask is made of gel, the company state that 90% of the mask is made up of “essence” thus promoting absorption. The product is intended to “awaken” the skin. Maybe I’m too far gone in the world of sleep deprivation…but I just didn’t rate this product. Its costs a pretty penny too. Is South Korean Skincare any good or is it just hype? In my opinion, South Korea may just be the Mecca of skincare. Paving the way with ingenious creativity, fun design and harvesting natural goodness and transforming it into a form that can be easily used by busy women for fast, effective and long lasting results. Whats your favourite natural beauty booster? I’d love to hear about all your skincare tips, please share them below. I love KBeauty lately… The products do what they say, which is important plus most of them are totally budget friendly. I am currently using some Tonymoly and cosRX products and I’m so into them. Cannot wait to try some of the products and brands you mentioned above.